Nose Graze — Young Adult book reviewsI am absolutely drowning in indecision. Did I like The Promise of Amazing? Was it only okay? UGH! I don't know! !I started out on excellent terms with The Promise of Amazing. I thought Wren was funny, had a great personality, and I could completely relate to her.The NHS evaluation made [being quiet] sound like a character flaw. Something I could improve. That's just not how it worked.YES YES YES! Agreed! Some people just aren't loud and chatty. Some people, like myself, are more quiet and reserved. That doesn't mean we're bad students, or that there's something wrong with us, or that there's "room for improvement". We're just quiet. We can still do good work and get good grades. SHEESH! I remember tons of parent-teacher conferences where the teachers would say, "Ashley is a good student, but she could speak up more in class." UGH! LEAVE ME ALONE!So in that sense, I completely and totally clicked with Wren. She was the quiet girl, and so was I! I loved that.Then in steps Grayson. He was also a great character. He was definitely the more flawed one. He had a dark and sketchy past that he was trying to overcome, but it kept pulling him down. I like how his flaws made him seem real, and how he really worked to change and become a better person.So why not a higher rating? I think there are two main reasons for this. First, I think the book fizzled out a little towards the end. At first I really liked Wren and Grayson's relationship, but I didn't keep loving it. I wanted to see more dates and intimate moments. I think there was too much constant drama surrounding their relationship. There was always an obstacle or someone trying to sabotage what they had. They only actually went on one *proper* date; the rest was just sending texts, or seeing each other in random places. I wanted more of an intimate boyfriend/girlfriend book, and I didn't feel like this one had enough of the actual dating/relationship side.You could also say that the book was a little insta-lovey as a result of all that. As I said, they only went on one real date, and yet they eventually throw around the word love. Is it really love? I don't think so. The insta-love didn't bother me as much as it has in other books, but it was still there.. a little bit.And secondly, I was a little disappointed by the ending. The author spent the whole book building up this evil douchebag of an antagonist. But....At the end, I felt like he didn't get what he deserved. As Grayson put it:After all the crap he'd pulled, he still got what he'd wanted the most. Where was his karmic payback?I could not agree with this more. Luke was a huge dickwad, but he got out totally unscathed. He did horrible things and yet he still got into his college of choice and totally got off completely clean. What the hell? I wanted him to crash and burn.. hard. But the lack of payback made the ending seem a bit anti-climactic. I wanted freaking REVENGE!Overall, The Promise of Amazing started out strong, with an interesting main character and a few funny lines. But towards the end I wasn't as hooked. I wasn't devouring it and I actually did find myself skimming a little. 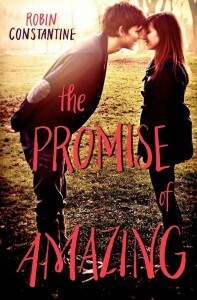 The Promise of Amazing wasn't quite amazing; I'd say it was pretty good.